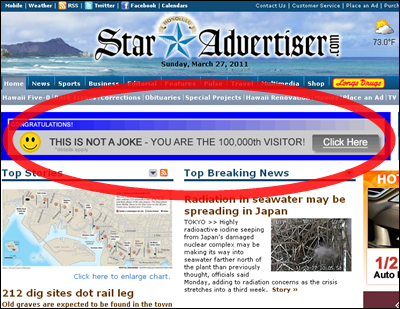 HOTEL WAIKIKI: If I see .... if I hear .... this ad one more time, I'm gonna scream real loud. If I see .... if I hear .... this ad one more time, I'm gonna scream real loud. If you click the button, will the ad go away permanently? Ummm... I guess I haven't seen this one. I don't think I'll click on it if I do. The ad I really hate right now is the Subway ad with the office workers speaking with childish voices, "Hi Samantha." "Hi Todd." "Do you want to be my boyfriend?" Arrrrghhh! Kay- the tv ad that irritates me the most is the Goober Guy spokesman for Time Warner cable. That person is real life stupid. I wouldn't click on it too.